Accommodates either C-Fold or Multi-Fold towels, Lock prevents theft of towels. Heavy gauge steel with see through towel gauge and hinged locking cabinet. 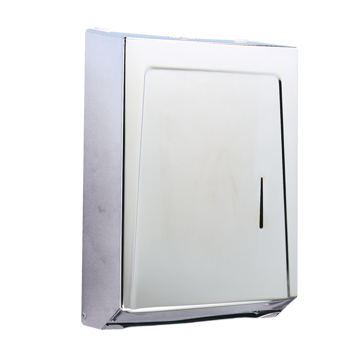 Towel cabinet features full push bar to dispense paper; meets ADA requirements when mounted properly. Smoke colored see-thru plastic front. Powder coated enamel is durable and attractive. Features sturdy piano hinge and see through towel gauge for at-a-glance reference. Self-locking cabinet holds two packages of standard single fold or junior towels. For multi-fold or "C" fold towels. Heavy gauge steel with see through towel gauge and hinged locking cabinet. Replacement key for lost or damaged key that comes with dispenser. Use with 630W, 990W, 989SS and 630C dispensers. The Centerpull Towel Dispenser is a large capacity dispenser designed to reduce maintenance costs and provide a hygienic hand-drying environment. The Integra Roll Towel Dispenser offers a hands-free alternative with an integrated dispensing arm on the front of the unit.